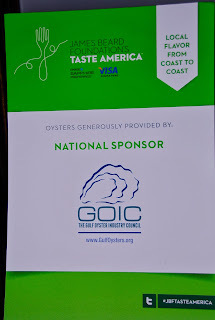 The Weekend Gourmet: Guest Blog for the Gulf Oyster Industry Council at James Beard Foundation's Taste America Event! Guest Blog for the Gulf Oyster Industry Council at James Beard Foundation's Taste America Event! Michael and I recently had the privilege to serve as guest bloggers for the Gulf Oyster Industry Council (GOIC) at the James Beard Foundation’s Taste America event in New York. We took part in a contest via Facebook a few weeks ago and won the opportunity to attend and cover a Taste America event at one of eight cities across the country. We opted for a weekend in New York to attend its Taste America event, which was named The Artful Chef -- Linking the Worlds of Fine Art and Food. We arrived at The St. Giles Court Hotel on Friday afternoon and were thrilled to discover that we had been booked into a huge suite that included a large balcony that featured amazing an amazing view of The Chrysler Building, a large living room, and a comfortable bedroom. The hotel used to be a residential building, so it was very much like staying in a New York apartment. We absolutely loved it! We settled in a bit before getting dressed up for the dinner, which was held at Tom Colicchio’s Riverpark restaurant. Our host for the event was the GOIC's Ron Thompson. He was a fabulous host, introducing us to many industry people who he knew…as well as introducing me to my first-ever raw oysters! We arrived at Riverpark just as the cocktail hour was in full swing. We enjoyed a glass of champagne and a variety of creative passed hors d’oeuvres created by Riverpark Chef Sisha Ortuzar. 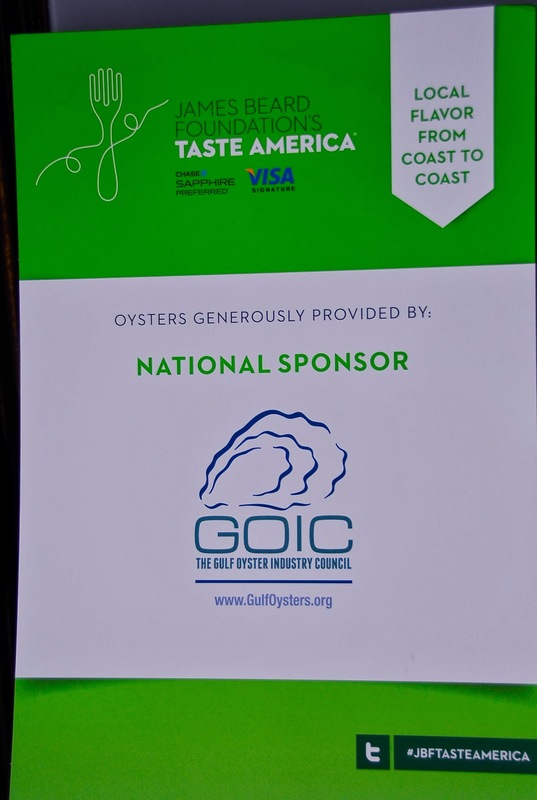 GOIC was a national sponsor for the Taste America events, and they provided a huge oyster bar for guests to enjoy. I had never eaten a raw oyster before, but I knew this was the perfect opportunity! The oysters were shucked fresh and immediately placed on ice. Ron, pictured with me at right, showed me how to properly prepare the oyster with some cocktail sauce and lemon juice. Then, I took a deep breath and went for it! The flavor of the oyster was briny, with a good bit of spice and tang from the added condiments. I’m not sure why I waited all this time to try a raw oyster, because it was quite delicious once I got over my fear of the texture of a raw oyster. Michael and I both really enjoyed the Oyster Tacos with Green Tomato, Pickled Onions and Cilantro that were offered as a passed hors d’oeuvre during the cocktail hour. Before we knew it, it was time to go into the main dining room to take our seats for the four-course seated dinner. Each large round table seated eight guests, so we had a chance to share this fabulous dining experience with several fellow food lovers. The lights were low, and the table was beautifully decorated. One look, and we immediately knew that we were in for an evening to remember! The evening's four-course dinner menu was created by four well-known chefs: Alex Guarnaschelli from Butter and The Food Network, Daniel Patterson from San Francisco’s Coi, Andrew Carmellini from Locanda Verdi, and Brooks Headley from Del Posto. Each course was paired with wines from Greece. We had never tasted Greek wines before, but we loved them. Shortly after being seated, the First Course was served: Beet-Cured Wild Salmon Carpaccio with Kohlrabi, Grainy Mustard and Crispy Shallots. This dish was light and very refreshing. We loved how the sweetness from the kohlrabi and sharp tang from the mustard worked with the wild salmon. The combination of flavors and textures in this gorgeous dish was amazing. The Second Course was the very creative and delicious Sunchoke Soup: Sunflower and Chanterelles. The bowls were placed in front of us with a pesto-like sunflower seed concoction and thinly sliced chanterelles and sunchokes. The velvety sunchoke soup was poured into each bowl tableside, which made for a dramatic presentation. 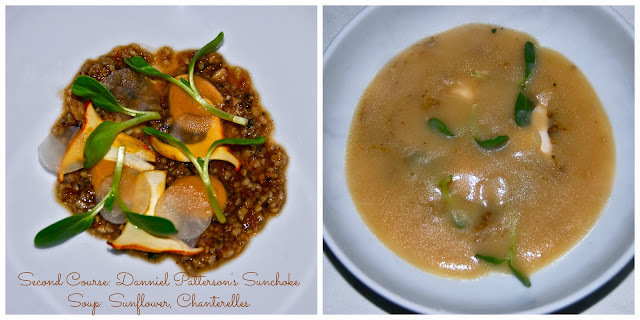 This soup was creamy and light, with the nuts, chanterelles and sunchokes providing the perfect amount of texture and crunch. The only word to describe this soup is sublime. The Third Course was Braised and Roasted Veal with Heirloom Polenta and Broccoli Rabe. This dish featured tender veal prepared two different ways, served over creamy polenta. Each serving was also topped with slightly bitter broccoli rabe. The two veal presentations had different textures, but both tasted amazing. The earthy polenta and bitter broccoli rabe were fantastic textural and flavor additions to this complex main dish. The Fourth Course was Butterscotch Semifreddo with Sour Melon and Sbrisalona. Everyone at our table raved about this dessert…the texture of the semifreddo was light as air, and the crunchy sbrisalona topping provided the perfect textural contrast. If I could’ve had two servings of this dish, I would have...it was that good! It was paired with a fantastic Greek VinSanto sweet dessert wine. This creative dessert was the perfect ending to a fabulous meal. With that, our amazing dinner experience was over. It was an evening full of fabulous food, excellent paired wines and fabulous dinner conversation with our table of fellow food lovers! We had a fabulous time chatting with Ron as we lingered for a bit over coffee. Before we knew it, it was time to head into a waiting cab to be transported back to our hotel. We bid Ron goodbye for the evening in the lobby. 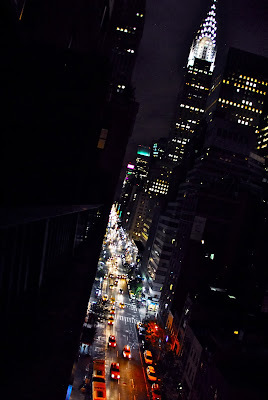 We went back up to our suite to enjoy the amazing nighttime view of the city below us before we collapsed into bed. 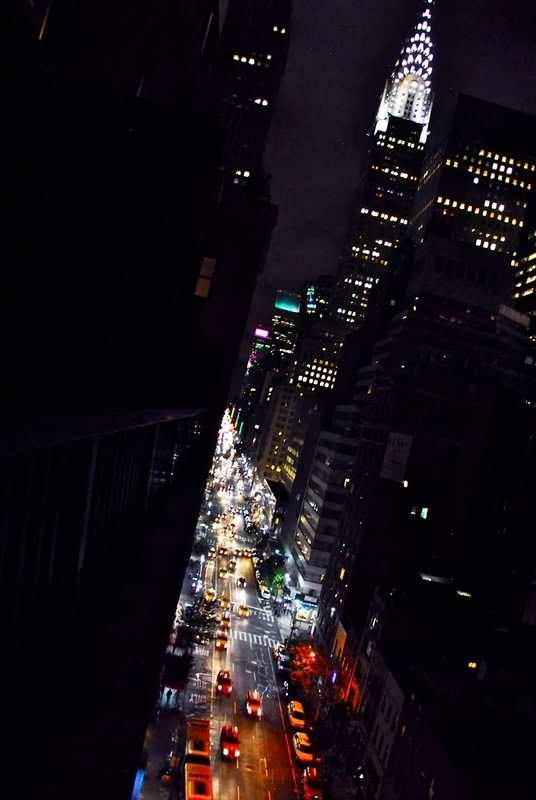 As you can see from the picture at left, we had a stunning nighttime view of The Chrysler Building from the balcony of our suite! We admired the view for a bit as we marveled at what a fantastic evening we had just experienced. 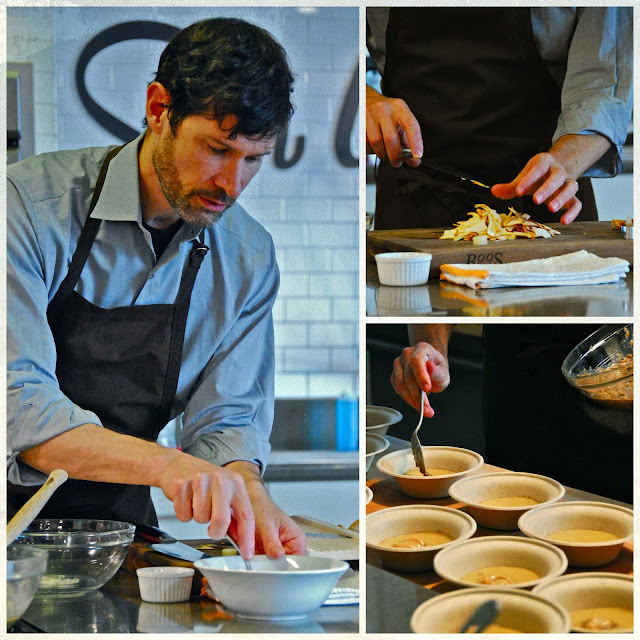 However, we still had one more Taste America event left to cover the next morning: a cooking demonstration by Taste America All-Star Chef Daniel Patterson at Sur la Table! We met our GOIC host Ron in the hotel lobby the following morning and quickly made our way to Sur la Table in Midtown Manhattan. We met the President and CFO of the James Beard Foundation, who were gracious and welcoming hosts! We had front-row seats for this cooking demonstration, which allowed us to watch up close as Chef Patterson prepared the amazing sunchoke soup that we had enjoyed at dinner the previous evening. We discovered that the soup is vegan and contains no cream, despite its velvety texture. We both enjoyed hearing Chef Patterson discuss his cooking/food philosophy as he demonstrated how to make the soup. I especially loved watching his technique as he sliced the chanterelles and plated the soup. Then came the best part: we got to enjoy another serving of this delicious soup! With that, our amazing experience covering the James Beard Taste America event on behalf of GOIC had come to an end...but not before we snapped a quick picture of GOIC's Ron Thompson and James Beard Foundation President Susan Ungaro first. Then, it was time to bid our wonderful host Ron goodbye and head out for other fabulous food adventures in New York. We sincerely can't thank GOIC enough for sponsoring their guest blogger contest and sponsoring our trip. It truly was an experience that we'll never forget! I’ll be sharing all of our other New York experiences with you in the coming weeks, so be sure to come back to hear about the rest of our recent Fall adventures in New York...everything from food to music and museums. 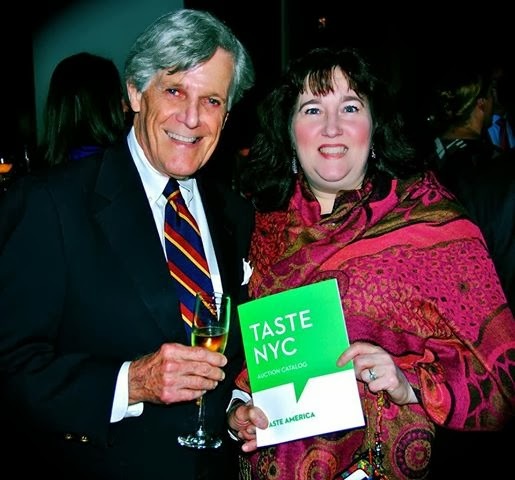 Disclosure: GOIC provided us with airfare, hotel and tickets to the James Beard Taste America event in New York to facilitate our coverage of the event on their behalf. We received no further compensation, and all photographs are copyright Michael K. Garcia 2013. They may not be copied or otherwise used without prior permission.